Looking to buy an electric blanket made in USA? Then look no further because there is none to be found. The closest we come to heated bedding made in USA are heated mattress pads. A heated mattress pad, also known as an electric mattress pad, is a formidable competitor to a heated blanket. Their popularity has surged in recent years. Comfort House customers buy them 2 to 1 over blankets. In fact, the decision is not usually over which blanket to buy but rather should I buy a blanket or a mattress pad. 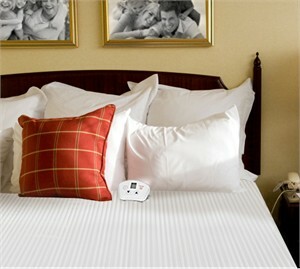 ElectroWarmth Bed Warmer is made in USA. Our ElectroWarmth made in USA heated mattress pad is available in all sizes including the otherwise impossible to find heated bedding sizes of split queen, split king, king xl, and truck mattress. So you can stop your search for a made in USA blanket and consider a heated mattress pad instead.